This November our training classes will focus on Wireless networking. We will organize all available wireless engineering level courses, also wireless basics and UBWS on demand. For everyone who attended any wireless training in November 2018 we have a special gift - Wireless Workshop with presentation/demonstration and discussion on your questions, which will take place on 01.12.2018 in ITCE training center. This year MikroTik surprised us by announcing a lot of new switches. This was quite unexpected for us in PG Net Pro. CRS309-1G-8S+PC is a quiet switch with 8x 10G ports. You can check the MikroTik presentation from the MUM for more details. - They have finally announced the range for LHG 60G – it is 1.5km. - A nice small device the first of that kind is the PWR-Line AP, a powerline device with an Ethernet port and built-in 2.4GHz AP. - We also want to mention the new mANTBox2 12s, which is a perfect solution to cover on 2.4GHz outdoor spaces like pools, gardens etc. 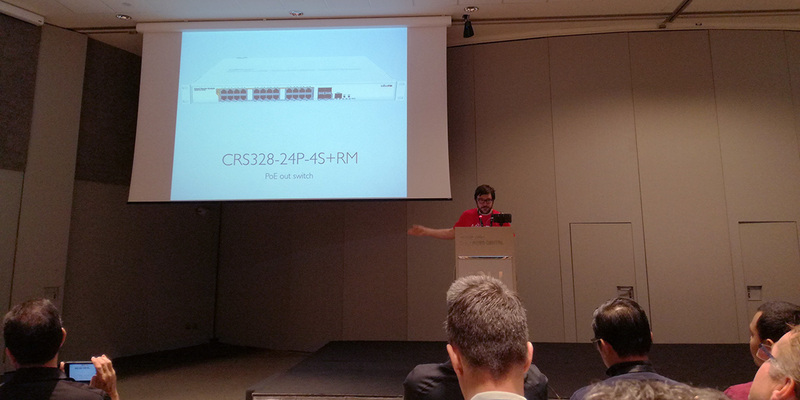 Today we tested the new CRS326-24G-2S+RM which is the first released dual boot switch by MikroTik. They announced it as "a special version of the CSS326-24G-2S+RM" which we reviewed several months ago. As the CSS version had rather basic capabilities and also we saw on MikroTik website that the CRS226 series are discontinued - if consider that the ports are the same, probably to be replaced by the CRS326, we were curious to see the CRS326 with RouterOS. When powered on the device booted in RouterOS in complete silence (no speaker). We upgraded the RouterOS to 6.39.2 and started to look at the menus. We were shocked when we saw that the switch menu looks exactly as the switch menu of all small RouterBOARDs with switch chip, and has the same functionality too. It is not like the CRS226 or any other RouterOS powered switch. So probably this is all that the Marvell chip can do. In the official brochure MikroTik says that it can "work in routing mode for a few configurable ports" which sounds like not all ports can be used as RouterOS interfaces. We tested IP configuration on all ports simultaneously (no switch configuration) and we have good news - all 26 ports can be used as regular interfaces. This is a 26-port router! With its 800MHz ARM CPU and 512MB RAM, the CRS326 is an interesting device. You have to consider that it has 16MB flash and no option for external storage. In /system routerboard settings you can choose to boot SwitchOS which was the next thing we did. As expected it's not different from CSS326 regarding menus and functionality, except for the system page where you have the Boot RouterOS button. The two operating systems are completely separate, they keep their own configurations separately and no additional partitions are visible in RouterOS. The reset of the one does not affect the other OS. The reset button resets the configuration of RouterOS and sets the boot-os=router-os but the SwOS configuration stays intact, we couldn't find a way to reset it with the button. The CPU temperature without load is above 50°C. We observed that when running RouterOS the temperature is about 2 degrees higher than it is when running SwOS. Device supports jumbo frames - maximum L2MTU is 10218. Our conclusion is that the CRS326 is a very interesting device as a router with 26 ports, probably suitable for all-in-one device for small office where no wireless network is needed (or it's provided by additional access points). It is definitely not a device to be used as an advanced switch. The maximum you can get from the switch is in SwOS, where LAG and Ingress Rate are available in hardware. All basic switch functionality including VLANs and RSTP is available both in RouterOS and SwOS. Spanning Tree Protocols on CRS! On the first day of the European MUM 2017 in Milan MikroTik have announced some very interesting new products that will be available soon. We were very happy to see the new PoE switches - CRS112-8P-4S (8 PoE ports, four SFP ports) and CRS328-24P-4S+RM (24 PoE ports, four 10Gbps SFP+ ports), both supporting 802.3af/at with per port autodetection of the PoE standard. That was something everyone was expecting for a long time. For the first time MikroTik are releasing wireless products on the 60GHz free wireless band, currently two devices - the wAP 60G for short distances (up to 100 meters) and the LHG 60G for longer distances, both providing 1Gbps full duplex (wire speed) and equipped with powerful 4-core ARM CPUs. A big surprise for us was the Woobm (Wireless out of band management) - an interesting and very useful idea which provides access to the router for management in a different way. It's a simple USB stick that can be configured as an Access Point or a Wireless client, with built-in web server, as mentioned it should be very affordable. You can check all interesting announcements in the MikroTik presentation on the MUM website. No switch-chip - all Ethernet ports are directly connected to the CPU, no more shared 1Gbit to the CPU for switched ports. We see it as an improvement, because on devices of that class it doesn't make sense to waste ports for switching, now we have more equal ports to be used at full potential. Combo-port - a software interface that has two hardware ports: SFP cage and Ethernet port. You can choose which one to use, or use them both to create a very interesting setup - hardware fail-over. That combo port comes with "C" in the product naming. 100Mbps SFP modules support - the first MikroTik device that supports 100Mbps SFP modules. Yes, that is not an upgrade but update, which can be convenient in some cases. The hAP ac lite now is available with tower case - compared to the hAP lite's tower case, we have an improvement in the design - the case has detachable base which allows horizontal or vertical standing position and wall mounting! OmniTIK 5, QRT 2, SXT 2, DynaDish, SXT HG5 ac, SXT 5 ac, SXT SA5 ac and SXT Lite5 ac were also updated. After adding the master port to a newly created bridge with RSTP, all the ports appeared there like expected - they're not part of the bridge, but just shown there to show STP status, the traffic is not passing through the CPU. We can only say: Thank you MikroTik and keep up the good work! 4 threads MMIPS CPU and IPsec hardware acceleration, we were wondering could it really be on the same price? same price as the old hEX - less than 90 BGN + VAT, so we took 2 devices to have first hand experience and do some tests on our own. Running a simple configuration with maximum MTU and packets of such size that fragmentation will not occur, Bandwidth Test with UDP packets from the routers (which is not the ideal way to test), the throughput was 484Mbps with AES128 (pic1), 356Mbps with AES256 (pic2). That is remarkable! In real conditions the MTU will probably be 1500 bytes, so we also tested with 1500 bytes MTU to do TCP traffic between hosts behind the routers, the throughput was ~430Mbps with AES128, ~325Mbps with AES256 (in one direction or sum of both directions), which is more than enough for most of the Site2Site setups. This device gives us the ability to build very affordable secure solutions for companies with many offices, by using for example appropriate CCR device(s) for the Head Quarters and the new hEX revision 3 to run the network and provide secure connection for the branch offices. With it's powerful CPU and IPsec hardware acceleration we highly appreciate the new hEX and in our opinion it's a great device!